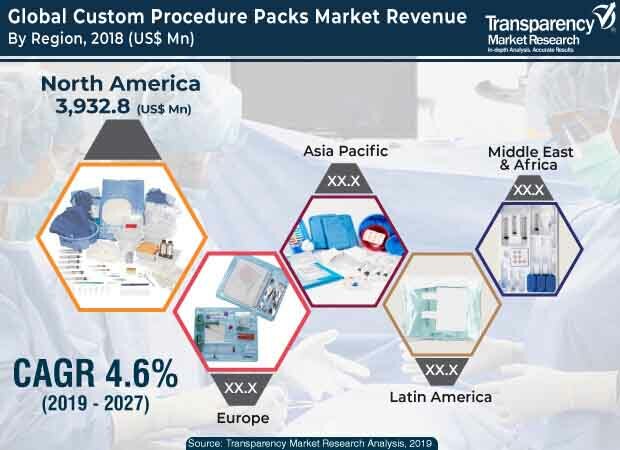 Transparency Market Research (TMR) has published a new report titled ‘Custom Procedure Packs Market - Global Industry Analysis, Size, Share, Growth, Trends, and Forecast, 2019–2027.’ According to the new report, the global custom procedure packs market was valued above US$ 10,000 Mn in 2018. It is projected to expand at a CAGR of 4.6% from 2019 to 2027. Rise in geriatric population that leads to an increase in the number of surgeries, caused due to severe diseases and performed at hospitals and clinics, and a rise in the number of hospital base with more number of OT rooms are likely to boost the custom procedure packs market during the forecast period. North America and Europe are likely to dominate the global custom procedure packs market due to the high cost of the procedure packs and high awareness about the benefits of custom procedure packs in surgeries in these regions. Increase in number of surgeries and favorable surgery subsidiaries from governments of countries, such as China and Saudi Arabia, are likely to boost the custom procedure packs market in Asia Pacific and Middle East & Africa in the near future. The medical device industry acknowledges that human error would occur. Hence, devices are designed in such a way that errors are prevented. However, it was found that several times, advanced devices provide incorrect results. For instance, recently in April 2015, DeRoyal Industries Inc. issued an urgent medical device recall notice for its custom surgical packs that contained Medtronic Covidien Devon(TM) Light Gloves, which split or developed holes during application. This led the devices to be recalled from the market. Such incidences are a key factor restraining the market. The report offers detailed segmentation of the global custom procedure packs market based on use, product, and end-user. Based on use, the single use custom procedure packs segment is projected to dominate the global market, as it helps prevent surgical site infection during the surgery, while the reusable procedure packs segment is expected to lose market share during the forecast period, as reusable packs have high risk or cross contamination and also increase the hospitals stock inventory. In term of product, other segment, which includes cosmetic procedure packs and urology procedure packs is anticipated to gain higher share of the market, as compared to others procedure packs. Its share is anticipated to rise from 17.0% held in 2018 to surpass 18.0% by the end of 2027, due to an increase in the number of cosmetic surgeries in countries such as South Korea, the U.S., and Brazil. In term of end-user, the hospitals & ambulatory surgical centers segment accounted for more than 70% share of the global custom procedure packs market, in terms of value, in 2018. The segment is anticipated to expand at a rapid pace in the near future. The market share held by the segment is likely to rise to reach more than 75% by the end of 2027. Rise in number of day care surgeries and increase in number of hospitals in developing regions are likely to propel the segment during the forecast period. In terms of value, North America held a major share of the global market in 2018. This is due to the high rate of adoption of custom procedure packs in surgery. The market in Europe is projected to expand at a high CARG, due to high incidence of diseases, such as orthopedic and cardiovascular disease, in Europe, which propels the demand for utilization of custom procedure packs to carry out surgery. This, in turn, is projected to propel the custom procedure packs market in Europe from 2019 to 2027. Rise in healthcare investment in countries, such as China, in the region and rise in the geriatric population, which leads to several orthopedic and cardiovascular issues that require surgery, are anticipated to drive the custom procedure packs market in Asia Pacific. Rising incidence of fractures due to low-impact accidents among the obese population in Middle East & Africa is a major factor fuelling the market at a steady pace. For instance, according to the International Osteoporosis Foundation, in Iran, 50,000 hip fractures were recorded in 2010, and the number is projected to grow to 62,000 by 2020. Consequently, demand for surgery is also projected to increase. These factors are likely to propel the custom procedure packs market in Middle East & Africa. The market in the region is expected to expand at a CAGR of above 4.5% from 2019 to 2027. The report provides profiles of leading players operating in the global custom procedure packs market. They include Medline Industries, Inc, Mölnlycke Health Care AB, Owens & Minor, Inc. Cardinal Health, B. Braun Melsungen AG, Unisurge, 3M, Thermo Fisher Scientific, Inc., and PrionTex. Market players adopt strategies such as expansion of product portfolio by developing new products or through acquisitions and licensing agreements. In 2017, 3M signed a distribution agreement with Owens & Minor Inc.’s subsidiary Owens & Minor Ireland. Under this agreement, Owens & Minor Ireland would be responsible for the distribution of 3M customer procedure trays in Europe. Other key players are also adopting similar strategies.